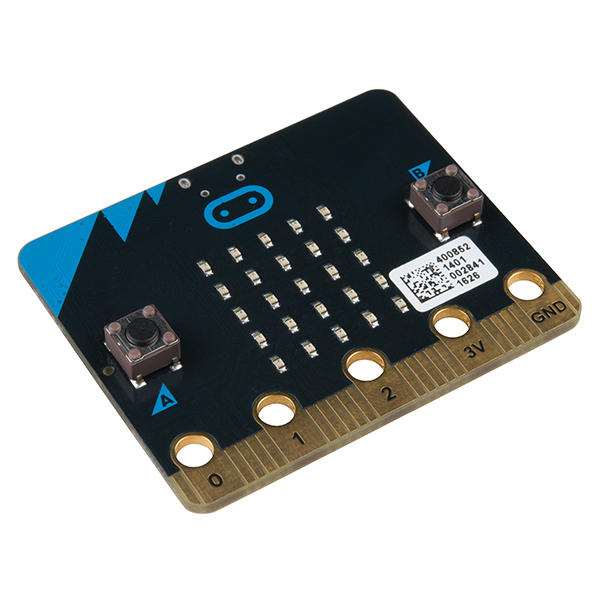 micro:bit comes with a variety of on-board modules, including a 5x5 LED matrix (also supports light detection), 2 programmable buttons, motion detector, Compass and Bluetooth® Smart module. Additionally, you may attach more modules such as a servo motor, RGB LED lights through 5 I/O rings or 20 edge connectors. Microprocessor: 32-bit ARM Cortex M0 CPU. A 5*5 LED matrix with 25 red LEDs to light up and can display animated patterns, scrolling text and alphanumeric characters. On-board motion detector or 3-Axis digital accelerometer that can detect movement e.g.shake, tilt, or free-fall and use it to control motion activated games. A built-in compass, 3D magnetometer to sense which direction you're facing and your movement in degrees and detected the presence of certain metals and magnets. Bluetooth Smart Technology. Connect the micro:bit to other micro:bits, ﻿devices, phones, tablets, cameras and other everyday objects. 20 pin edge connector: This allows the micro:bit ﻿to be connected to other devices such as Raspberry Pi, Arduino, Galileo and Kano through a standard controller. Micro-USB controller: This is controlled by a separate processor and presents the micro:bit ﻿to a computer as a memory stick. Five Ring Input and Output (I/O) including power(PWR), ground(GRD) and 3* I/O. The micro:bit ﻿can read values from sensors and control things like motors or robots.